The Fitness Philosopher: Fitness Tip: Do you want to look fit? Start smoking cigarettes! Fitness Tip: Do you want to look fit? Start smoking cigarettes! Do you want to look fit? Start smoking cigarettes! Cigarettes? you mean like those 'cancer sticks'??? YES! 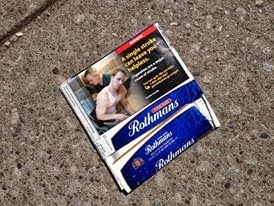 Here I am on a pack of cigarettes- in another "possible world" where I had a stroke because I smoked cigarettes. And while the picture is real, the people are real, and the campaign is real, the story the picture tells is real, the fact is the person in the picture (ME) is not really disabled nor had a stroke. Just like all of tv and visual media, it is a world of make believe and the internet is the world of pictures and make believe. So I am sure many people see this and think- that guy really lives in a wheelchair. What does that have to do with fitness. Well the fact is that you cannot tell my fitness levels from a doctored photo, and the same goes for most pictures in fitness magazines and websites.The problem in fitness today boils down to this. The public associates a ripped body with health and fitness. Generally because when the public actually see athletes perform on TV or wherever they are in contest shape and the TV focus on the sexiest images they can find. So people think all athletes and people who are fit, also look like underwear models. This is the first big mistake, fitness and appearance do not go hand in hand. For example, look at this athlete, who performs very well but certainly would not get a Calvin Klein modelling contract. 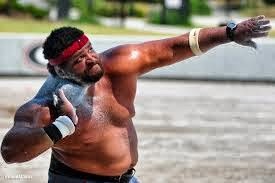 Here is a picture of a real athlete, as in a shot putter at a recent Olympic Games in Athens. Pro Bodybuilder, now dead: literally overdosed on physique drugs. But he was shredded! but dead! This is not a rant about the pros and cons of steroid use or HRT or any of that tired old story, just watch the relatively entertaining documentary Bigger Stronger Faster and come to your own conclusions about the role of steroids in modern north americana culture. Or better yet, watch The Wrestler and how he approaches getting in shape for the big match. Very American. Conclusion: looking fit and being fit are not necessarily connected. Okay got it! Here you will find solid, rational and functional advice that will help regulate your appetite, all you have to do is start smoking cigarettes.And this is where is gets crazy! In the world of Facebook and Instagram pix, to be considered fit you a only need to look it, to win a competition you only need to look a certain way for a few hours really. That is called "peaking". So why would someone not start smoking, since health seems no longer to be part of the equation? Seriously this is a major topic and the source of many debates. (ps- just in case the humour is lost on anyone :) I do not recommend smoking but use it as an example of the types of unhealthy things people will do for the appearance of health and fitness at the expense of health and fitness. Love your example of smoking to stay thin but totally unhealthy. And its funny because just today I finished up a post about a martial artist that works to teach people the difference between fitness and health. you guys should talk! great post.